Description of "नाज़-ए-हिन्द सुभाष (eBook)"
There's been a thorny issue making each Indian uncomfortable from 18th August 1945. Three generations have grown since that day, but that pain still bleeds into one's conscience, because each generation inherits this pain from their predecessors. What happened on 18 August 1945 in Taipei? Did the plane carrying Netaji really brace a fatal accident and silenced our beloved hero? If that's the truth, then what's the point behind keeping documents related to Netaji under heavy scrutiny, enclosed in top-secret directories by the Indian-Japanese-Russian regimes? The book doesn't just try to find out a reasonable solution to this sophisticated query. Fundamentally, the book is centred on the international footprints and movements of Netaji from 1941 through 1945. A few people only know that Netaji donned the name of "Jiauddin" when leaving the country in 1941; that he embraced the title of "His Excellence Majotta" in Germany; that his code-name was "Mastuda" during his submarine voyage; and that he was popularly titled "Chandra Bose" in Japan. Moreover, Netaji designed a potential military in Germany; his submarine voyage lasted a significant 90 days; he transferred from German to Japanese submarine near Madagascar; and that Rasbehari Bose organised the INA in Singapore. These aren't facts generally known to the common people. Accordingly, this book logically classifies as a "must-read" for younger citizens because of multiple reasons. One of them is the fact that our textbooks lack of any substantial amount of knowledge regarding Netaji's international movements and his heroic persona reflected in the Imphal-Kohima war. In fact, Netaji's image is of someone who led a mighty military revolution against “the empire." Considering his revolution was for freedom and his ideals and personal character were of higher ground, yet the rulers are rulers, British or Indian: why would they want to preach their next generation about a reactionary, military-backed person who led a magnificent revolution against them? In fact, the book houses an array of happenings that have fantastic possibilities of their inclusion in the textbooks. The book raises another question: did our "non-violence policies" really plant emotional changes in British minds and persuaded them to an extent that they would abandon their rule on Indian soil? Or, in contrast, did Netaji's military activity, coupled with the surfacing of public agitation and military mutiny after the court-martial of INA soldiers made the British think that it might finally be the time to pack? Now it's time to frame an open and logical debate on this question! The book, in its entirety, seamlessly showcases a majestic personality of Netaji, so majestic that the characters of Hitler, Mussolini, Tojo, Stalin, Churchill, Roosevelt, etc. feel rather plain comparatively. The book also successfully frustrates everyone on the hardships of Netaji's personl life and how his "Dilli chalo" urging never materialised. India would've been totally different if destiny chose to make Netaji the first ruler of independent India instead of a tragic hero. Today, after six decades of independence, what does India look like? An ocean of poverty, malnutrition, illiteracy, and unemployment with certain islands of prosperity and development, where selfish deeds lead to giant corruptions each day. In this scheme of present, the book suggests that we adopt a dictatorial pattern of democracy where only people of "Netaji-like" characteristics can administer, at least for a few years! There'll be no surprise in any resurrection or recreational revamping of the nation after 2012, even if remotely affected by this book. An artist of sketching, photography, and writings (that is Rekha-chitra, Chhaya-chitra, aur Shabda-chitra ka ek chitera). 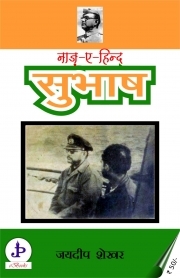 Reviews of "नाज़-ए-हिन्द सुभाष (eBook)"